In 2009 many companies will struggle against a tide of negative consumer sentiment, driven by the economic downturn. It’s looking like the days of free and easy spending are over, for now. In startupland the losers will most likely be those with low reserves of cash, but what about the established e-commerce heavyweights? Which e-commerce companies will fare better than others, and which ones will be hardest hit? And what can they do about it? It seems to me that the winners during this time of relative austerity will be those companies that delight their customers. As such, I have compiled a checklist of the things I’d be doing if I were the head of e-commerce at a retail company (although my suggestions can be more broadly applied to companies operating in other sectors). The greatest barrier to adopting some of these ideas is time and resources, but if you want to breed customer loyalty the first step is to build out a compelling shopping environment, where hassles are few and far between. Be sure to build a business case for investment on that basis. Here are my 20 suggestions to help you delight your customers, filed under four areas: strategy, service, user experience, and content. 2. Offer free delivery. Try it if you haven’t already. It is easy to understand and extremely compelling, even if the free delivery is on orders of a certain value or more. Use it in your marketing campaigns. 3. Help your customers help themselves. Educate them! We expect to see a rise in co-browsing services, to assist customers during the purchase journey. Russell Gould at Thomas Cook is doing some good things in this space. We also hope to see a greater adoption of online customer service tools such as intelligent FAQs. 4. Listen! Asking customers for feedback shows them that you value their opinion. The key metrics to focus on are repurchase / renewal intentions, as well as ‘referrability’. On top of this make sure you watch what’s going on offsite by monitoring your reputation, and by getting involved in the discussion, wherever it takes place. 5. Measure, measure, measure. We all know that measurement is the backbone of internet marketing. As a channel, it stands out from all the rest on the basis that you can prove ROI. You can watch and learn from customer behaviour. And you can optimise your website for individuals, for the best results. But it all starts with solid measurement. Without it, you are back to guessing about what works, and what doesn’t. 6. Offer a seamless journey across service channels. Improve visibility on customer behaviour for customer services / sales staff. Few companies currently get this right. 7. Send timely emails. Order receipt, payment confirmation, shipping confirmation, warnings about any order changes, post-sale thank you / ‘how was it for you?’ emails. Make it personal. Reassure customers. 8. Make it easy for customers to get in touch. This means including a phone number on your site, even if it is slightly buried – don’t do a River Island. It means allowing customers to email if they need to. 9. Respond quickly. Don’t delay on service. The faster the response to queries and complaints, the happier / more forgiving the customer. Remember that a slow response to emails will increase the pressure on (expensive) call centres. Always acknowledge the receipt of inbound email and set some expectations. 10. Be cool about returns. Display your returns policy prominently. Consider allowing customers to return goods offline, even if they bought them online. Pay postage costs. Nobody likes having to return goods, but if you reduce the headache factor it will help encourage further purchases. 11. Make sure your site runs smoothly, with no incidents. User experience is something that the vast majority of e-commerce companies have invested in over the years, but there is still a lot of work to be done. Tweak, test, iterate. Start all over again. 12. Make your interface sexier. Sites like mydeco, Polyvore and MartinandSosa are creating wonderfully rich environments for shoppers. Innovate and experiment. Allow customers to engage, and to want to engage more often. 13. Search functionality remains crucial. Take a good look at your search tools, and the way results are presented. Conduct some usability tests. Improve things. Enhance searchability by rolling out tags. Don’t do a Gap and ignore search, or think that it doesn’t matter. 14. Be compatible. After years of hype mobile is finally happening. Internet browsers are fragmenting. Monitor sizes are increasing. And everybody, to a man, still loathes Flash (official). Remember that a usable site should be an accessible site, and vice versa. 15. Remember past actions. Pre-populate forms, store items placed in the basket, make it easy for customers to amend their requirements or searches. 16. Finesse your product pages. Add lots of detail to product pages. Don’t bury shipping information in the checkout. Allow users to drill down into feature specifications. Make sure there are lots of lovely images to ogle. Add video if the product merits it. These pages are shop windows for individual products, so merchandise effectively and don’t scrimp on the detail. We’ve published lots of best practice recommendations in this area. 17. Introduce user reviews and ratings. Customer reviews can be extremely influential in driving sales, and provide useful – and free – search engine fodder. People trust other people more than they trust a manufacturer description. Build out your community. Encourage customer engagement and participation. Incentivise it, if you can. 18. Be persuasive. Good copy is essential, as it is the sales patter of the web. But persuasion also applies to well placed offers and other sales boosters, such as recommendations and linked promotions. Persuasion also applies to design and page layout. I have previously interviewed BJ Fogg and Bryan Eisenberg on this subject – both fascinating characters. 19. Optimise the customer journey. Experiment with A/B and multivariate testing programmes if you haven’t done so already. We’re hearing very good things from e-commerce companies that have done this. We think that onsite optimisation technologies will be embraced by lots more companies over the next year and beyond. 20. Personalise and segment. This follows on from 19 but should be applied right across the business, your marketing efforts, communications, and so on. Make your customers feel special. So there are 20 ideas for improving customer retention, loyalty, referrals, repeat business and satisfaction. Some are easier to implement than others. I reckon all are a step in the right direction. What else would you add to the list? Chris Lake is editor in chief of E-consultancy and can be found Twittering here. 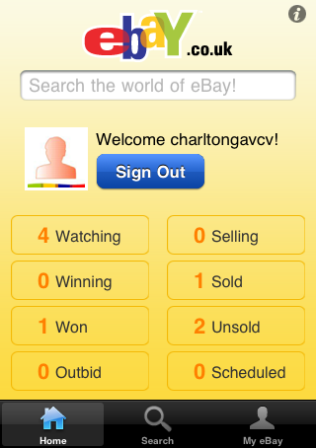 Updated a few months ago, the eBay on iPhone app lets you keep up with your buying and selling activity, as well as looking for new items, while on the move. I’ve been testing out the app to see how effectively it works for mobile..